"Fluffy sweet potatoes mixed with butter, sugar, and vanilla, and baked with a crunchy pecan streusel topping. This recipe was given to me by my brother-in-law." In a large bowl, mix together mashed sweet potatoes, 1/2 cup butter, milk, sugar, vanilla extract, and eggs. Spread sweet potato mixture into the prepared baking dish. In a small bowl, mix together brown sugar and flour. Cut in 1/3 cup butter until mixture is crumbly, then stir in pecans. 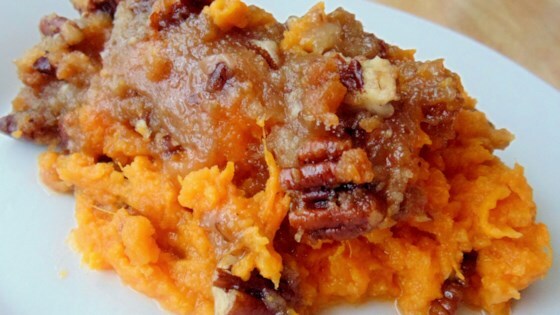 Sprinkle pecan mixture over the sweet potatoes. Bake for 25 minutes in the preheated oven, or until golden brown. Used canned sweet potatoes and reduced the amount of white sugar to compensate for the syrup. Loved the crunchy topping.